Peyton Lift-Top Coffee Table Simple in style and convenient by design, this Peyton lift-top coffee table has a little something for everyone. The black finish and satin nickel hardware are sure to appeal to contemporary decorators, while the turned table legs offer a classic compromise. Plus, for those in favor of functionality, it also features a lift top and storage shelf. Simple in style and convenient by design, this Peyton lift-top coffee table has a little something for everyone. The black finish and satin nickel hardware are sure to appeal to contemporary decorators, while the turned table legs offer a classic compromise. Plus, for those in favor of functionality, it also features a lift top and storage shelf. Height w/ Tabletop Lifted: 29"
After 4 months of use, one of the casters broke. I'm using it on a hardwood floor, so there isnt so much much strain on the casters as compared to wheeling it on a carpet. I had to flip the table over and remove all of the casters, till I can see if I could find better quality casters to install on it. Called Raymour & Flanigan and was told that there is no warranty on this item unless I purchased the additional protection. Also, I wouldnt put anything hard on the table since it shows EVERY SINGLE tiny scratch. I love the functionality of being able to lift open the coffee table and store things inside. There is a lot of room to put throw blankets, placemats, or other stowables inside. The casters are a little hard moving the table on carpet, but i still feel it isn't any problem. I love the large surface area and it fits well in front of my new leather sofa purchased with the table. I highly recommend this coffee table to everyone. A thoroughly enjoyable experience. Bought this for my daughter and she loves it. Very durable but looks great with her couch. Son-in-law loved it because it was easy to put together. Black lift table and new love seat and cuddler from raymour and Flanagan. Great Quality! Pillows included with sofa. I always buy raymour and Flanagan. Great product and customer service!! 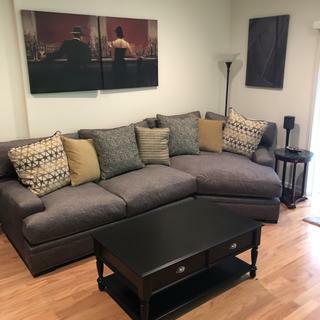 New sofa and table from Raymour and Flanagan! User friendly and classy! Great started piece. We love our new lift top coffee table. It allows for hidden storage. It's also convenient for those times when you need the table top closer to you for your lap-top our just for easier reach for snacks and beverages. Good quality and elegant looking. Easy to put together and a good size. I can even use my laptop without bending as it lifts easily. can't wait to go wait to get my sofa,to go with my table. i find there furniture is very good quality.service was great.they show you what you want in furniture, they don't try to shift you to some thing you don't want. they take time and they don't try rush you. Beautiful and clever function. Too new to see how serviceable it is. Love this table, top comes up and out for, eating, or doing homework, very study, and has castors makes it easy to move around room. This table goes perfectly in our new living room. It is on wheels and it has a lift top. its sturdy and fairly moderate in size. Seems to be put together well and moves pretty easily across the carpet. I love this coffee table, so nice how it easily lifts and easily goes back down! There's a ton of room underneath the lift portion and mechanics for it that you can store stuff, such as remotes, so that they aren't just everywhere on your coffee table. Love that it has casters so that you can easily move it around if needed. It is so easy to convert this coffee table into a work table to type away on a laptop or eat a meal at the sofa while the table becomes our dining table. Multiple uses in one table! I have owned this furniture for about three months. A great looking piece, and functional with the lift top option. The problem is durability. The table top is HIGHLY prone to scratches. I have the extended program and had to "make the call" less then two weeks later to cover scratches from items which shouldn't scratch a coffee table. I purchased a plexiglass top (at additional cost) which helps, but detracts from the allure of the piece. Although the mechanics are sound, I wish I had chosen more wisely. When this extended warranty expires in 4.5 years, what recourse will I have? Plan wisely if you purchase this as an item you actually intend to use. I have many other items from Raymour & Flanigan. All are beautiful, and durable. It would be great, but the lifting mechanism is held to the under side of some particle board by a few screws, not nearly sturdy enough. Would be easy enough to fix with some T-Nuts and bolts. I am very disappointed with this table. Initially I loved it. It had everything we wanted...storage, black color, lift top and wheels!!.. but in the first 3 hours of it being put together it already showed scratches on the top!!! from normal things that are placed on top of a coffee table. like my candle and some coasters... it looks like a child was racing toy cars all over it!!! and I don't have kids or pets so I know that nothing was done that should cause scratches ....I'm so, so, so disappointed especially because we did get the protection plan but it specifically says it does not cover scratches... smh. so I guess it was a waste of $350!! My family and I loved the coffee table . Love it...even though I don't drink coffee! Thanks to salesman who directed me to the table that met my needs. Have this table and do like it. However, how can I get the fingerprints off the table? What should I use to clean the top? BEST ANSWER: Dust with a soft, dry cloth. Wipe with a damp cloth and then dry thoroughly with a clean, dry cloth. BEST ANSWER: The Peyton Lift - Top Coffee table is made from Kiln-dried Asian hardwood, poplar, furniture-grade plywood and engineered wood frame materials with veneers. I love this table, but it scratches/scuffs easily. What can I use to blend the scratch and scuff marks? BEST ANSWER: For assistance with removing scratches and scuffs please call Customer Care at 866-383-4484, option 2. We recommend our Platinum Protection plan to initially cover against accidental damage such as breakage, scratches and chipping. Don’t bother to call Customer Care, inless you purchased the insurance. I was told they would come out and look at the table for $75 and than let me know what could be done to remove the scratches. IF they can repair the table there would be an additional charge. WILL THIS TIP OVER WHEN RAISED...HAVE GRAND CHILDREN,ALSO STORAGE DO YOU HAVE TO LIFT TO GET SOMETHING OUT OF STORAGE? BEST ANSWER: While the top when lifted will make the table more susceptible to tipping, the majority of the weight is still at the base of the table. The Peyton table does offer storage.